These current Pro - Fit pedals have a wider platform than the first generation and are fully compatible with the Ergobrain cadence magnet. I own six bikes all with these pedals and ordered a seventh pair in anticipation of owning one more bike and wanted to make sure I could get these pedals. They are bomb proof and have been using these pedals since the 1990s with no issues. I ride over 10,000k a year and can't say enough about these. 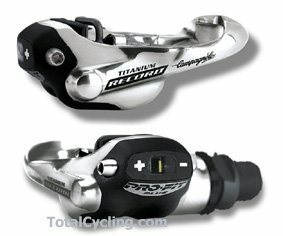 I just wished Campag would make them in the Chorus and previous Centaur/Potenza groups as they did back then. excellent shopping experience. Will buy again from Total cycling on my next cycling product. Delivered as promised. Great value, perfect, brand new condition.